Have you started a new planner with the advent of a new year? I am still using the Bullet Journal. After three years, it continues to work for me, though I have made a couple modifications. For my lifestyle, I found that daily logging got a little tedious and repetitive. Did I really need to write “laundry” every other day? 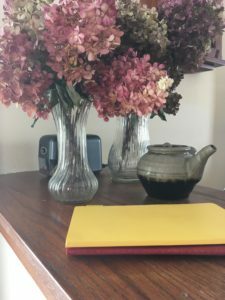 So much of homemaking is repetitive jobs, and I just do not have enough time or energy to tackle a number of additional tasks on a daily basis. So I switched from daily logging to weekly logging, and this pace suits me better. So instead of reading “Monday, Jan. 1st,” my first entry says, “January Week One.” Only four of these constitutes a month of tasks. There is always a half-week straggling either at the beginning or end of the month, and I will just combine it into week one or four. I get a few extra days to get my tasks done! I only write down unique tasks that are not part of my daily/weekly grind. If I do have an unusually busy day with lots to accomplish, say, before a trip, I can easily transition to a daily log. This requires much less journal space, and so I have switched from the classic Moleskine journal to a Cahier or Volant. I am still looking for the perfect option though. The Volant does not come with grids and the Cahier has only a cardboard cover, making it rather less durable for a year of use. Does anyone have a favorite slim journal? I didn’t realize you were keeping a bullet journal. I investigated and contemplated this idea last year, but though it may be too much to keep up. On the other hand, I just love the way the finished product looks. Would you consider bringing your journals to the CM Study Meeting…if they’re not too personal? I’d love to get a visual on how you set it up.